This scuba diving trip in Bali introduces you to the adventure sport of diving on a short one-day itinerary that includes one open water dive. Your dive will last for about 45 minutes and take you as deep as 40 feet into the Bali Sea. But before your dive, you'll work with a certified diving instructor in a classroom session and swimming pool training that will get you comfortable with an ocean dive. NOTE: This scuba diving trip in Bali does not require divers to be familiar with swimming. 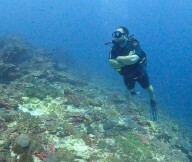 This scuba trip offers you the chance to go diving in the marine protected area of Nusa Penida. The area is home to several hundred species of reef fish that live and swim in the healthy and vibrant corals on the seafloor. An established marine park since 2008, the protected area of Nusa Penida is populated by lively aquatic dwellers including the frogfish, moral eels, lobsters, damselfish and several other small, brightly-coloured species. • Learn the adventure sport of scuba diving. • Dive into the Bali Sea and explore its incredible marine ecosystem. • Undertake 1 ocean dive as deep as 40-feet for 45-minutes. Divers are required to adhere to instructions of the dive instructor during the scuba diving trip in Bali. Arrive at the dive centre by 08:00 hrs and meet your diving instructor. You'll have a short classroom session where you'll be taught the basic skills and techniques of scuba diving. You'll test these skills in practice during a session of pool training as your dive instructor guides you through a confined water dive. After you're confident with your abilities, you'll move out to a dive spot in Nusa Penida's protected area. Here, you'll undertake one open water dive of 45 minutes that will take you 40 feet deep into the Bali Sea. Surface after completing the dive and travel back to mainland. Your trip ends here. A certified diving instructor will guide you throughout the trip. No accommodation is provided throughout the trip. Today's meal package includes a packed lunch served on the boat en route to the dive spot.